Another week under our belt and not a day has been without action. We were really feeling hopeful Kyle would be getting closer to downsizing his trach and pushing on to swallow tests so he could attempt to eat or drink. But sadly, after a few days of walking 3 times a day, one lap each time, he started showing extra signs of fatigue. My concern grew during his second round of collar trials, because he never slept once in the 48 hours (same to his prior 48 collar trial). I knew he was exhausted, and every time he started to slightly nod off I could see his oxygen saturation levels starting to nose dive. He would wake himself up by jolting a bit and this would just continue throughout the day. I raised my concern with the nurse letting her know that I started seeing a scary correlation between him being off the vent and not sleeping. She said she would keep an eye on it and express my concerns to the doctors. Later that day, one of the walks left Kyle feeling dizzy, and confused. He said he felt like he was in a bumper car as he started swerving all over the hallway on his roller cart. They then decided to cease the collar trials and place him on the ventilator so he could rest. I continued to feel like something wasn’t right. He kept falling asleep and having his eyes roll back in his head and then briefly became non-responsive to me. I kept trying to ask him where he was, and then he would say USA (which of course was correct) but then he would follow it up with “Party in the USA”. If anyone knows my husband they know that Miley Cyrus is not a typical musical choice for him. This response definitely raised a red flag. I pushed the nurse to contact the Respiratory Therapist. Once the Respiratory Therapist arrived they increased the sense of urgency because they knew Kyle’s normal demeanor. Once they took an ABG (arterial blood gas) to determine his CO2 levels, PH, Oxygen Saturation, etc. They then determined he his CO2 levels were extremely high. Not as high as before when he was in the 100’s but he was still on the higher end of 80’s. The doctors started showing more interest in his recent regression. Another blood test showed his Creatin levels had shot up to 1.7 which made for a concern with the kidney team. Now, with Kyle on the vent and his respiratory stabilized he was finally sleeping. They decided to check him out from head to toe to make sure they weren’t missing anything. They decided to put in an A line (in his leg) so they could more quickly draw ABG’s and monitor his CO2 levels. As they started to place the A line his blood pressure drastically dropped and they had to give him a blood transfusion to increase his pressure as well as other medications to help aid the drastic decrease. Once they had stabilized him they decided to do an overhaul of tests: kidney ultrasound, heart EKO to check for hypertension, heart ultrasound, CT Scan to check lungs, MRI to check brain activity, bronchoscope, and ran blood cultures to determine if there was an infection they were overlooking. I felt a sigh of relief that they were exhausting every resource to find an answer to the recent issues. After they reviewed each test everything was coming up negative. Of course I was happy but I couldn’t help but be concerned with the lack of answers. Later the neurology team came to our room to discuss his recent episode, and they said the MRI showed signs of an acute stroke. Of course the word stroke, made me cringe. The lobe where the fluid had drained from his brain was most associated with low blood pressure. All of which made sense seeing as he had such a pressure drop the night before. The team evaluated him, and said there would be no long-term effects of the stroke as strokes are quick and show immediate signs. So any damage that had occurred would have already been done. To be extra pre-cautious they did an ultrasound at the base of his neck where he had the EKMO to make sure it wasn’t causing any issues. They said everything looked great. The doctors admitted they had no idea why he had experienced all the other symptoms and would keep a close eye on him. The only irregularities I saw in him was his inability to hear out of his right ear. Of course he can’t hear out of the left ear due to a Mastoidectomy he had many years ago. So his inability to hear made for an interesting time. They contacted ENT (Ear Nose & Throat Doctor) to view his ear and they found that there was no nerve damage that they could tell, only some fluid in his inner ear, which they would treat with drops. We add Kyle's progress to the board everyday. As a few days went by they kept him on the vent and continuously checked his CO2 levels and placed him back on vent to rest whenever CO2 got too high. He did this repeatedly which I believe helped him build up more strength. He was able to sleep on the vent much better. and started using his passy muir valve more which was very encouraging. His walks started increasing everyday. Over those days the team continued to review his stats and contemplated the option of using hyperbaric oxygen therapy to help his contorted left lung, and ischemic feet. Dr. Daneshmand decided it wouldn’t hurt to try the therapy. The only downfall of the procedure was he was susceptible to seizures in the tank due to his previous acute stroke. They told us it was a very controlled environment and they would be able to assist with any emergencies. The risk was minimal, but the big requirement for the dive was to have tubes placed in his ears to avoid any excess pressure during his dive. Thankfully Kyle already had one tube in his ear, so they attempted the painful procedure of placing a tube in his left ear. ENT made multiple attempts at placing a tube but he had previously had reconstructive surgery in attempt to help his hearing but it had failed and left scar tissue. They decided a small slit in his ear would be enough to release any built up pressure for the dive. One of Kyle's feet, the skin is slowly sluffing off. The following morning the team assembled his gear and wheeled his bed to the chambers. It felt as though we were entering a completely different hospital. They had a historical display showing the history of hyperbaric chambers and the research they had done for the Navy, NASA, etc. It was an amazing display. The control center looked straight out of the 70’s as the doctor described but they were no other facilities as unique as Duke. I was in awe of the procedure, and was amazed at how it helped so many patients struggling with a variety of things. Kyle got his own chamber but most other patients sit in the same chamber as one another and hang out for the 2-hour treatment, and play cards. I couldn’t shake the oddity of it but liked the idea of a procedure that didn’t inflict pain. Once Kyle was set for his dive I waved him goodbye and the team worked with him for a few hours. They said that everything went well and would like to continue the therapy for the next 14 days. I look forward to seeing results as his feet could use all the help that can get, and his lung is a precious commodity. As of today, he had completed just shy of 48 hours on his third round of trach collar trials but his CO2 started creeping up so he was placed on the ventilator. We continue to push through as the holidays approach. We are looking forward to see our immediate families in the coming weeks. We wish everyone the happiest of holidays! Remember to hold your loved ones close and never forget the true meaning of Christmas. Everyday is precious. Besides Kyle having actual hiccups our journey hasn't been without the metaphorical ones. Kyle has been making progress, even when he has been thrown a few curve balls. His motivation to get up and walk has been inspiring. His feet have such large swollen blisters (which cover the majority of his toes) making it nearly unbearable to walk even for an average healthy person. 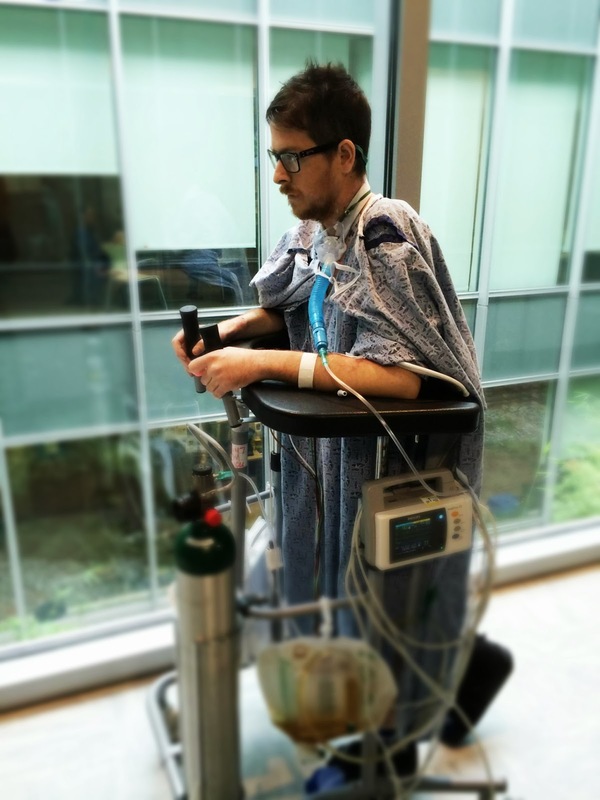 The walker he uses to support himself is draped in a spiderweb of wires all monitoring him, and measuring output from tubes used to drain his lungs. We joke that he is his own parade every-time we walk down the hall. He doesn't even get a few steps down the hall and a nurse or doctor is flashing him a smile saying "Wow, Kyle you look so good!" This response is only a small testament to the relationships he has made with the staff because of his contagious smile and personality. Every day he has pushed himself (with some encouragement) to make several laps around the ICU to increase his strength and endurance. Because of the tracheotomy Kyle has been unable to speak but he has attempted to use the Passy-Muir to be more vocal. Using the Passy-Muir isn't easy. The valve creates resistance for his lungs when he is trying to pass air around trach to his vocal cords. Once they down size his trach they believe it will be easier for him to communicate with the valve. He has found he is only able to stand it a few minutes a day. Luckily, I have become a great translator when he is lipping words a mile a minute to the doctors and nurses. I sometimes feel like I am in a silent movie. He also had a feeding tube placed in his stomach so he could continue to receive nutrients while he heals and becomes stronger. Kyle focusing on his next big step. After a week of making progress and having my mom there as another cheerleader for Kyle (and me) we were told he was going to be discharged to "Step Down." In order to get released to Step Down you have to be off the ventilator for 48 hours, and showing signs of progress. The term "Step Down" is used quite frequently by families and staff here. It is the place of progress, even if the rooms are tiny and crowded it means their loved one is that much closer to going home. I was happy to hear of his discharge once he hit the 48 hours but sad to have my mom leaving. But I knew I would be seeing another beautiful face later that day. Did I mention Kyle and I have a wonderful support system? Alli, Kyle and I's Highschool friend was coming to visit. Not only is she a friend but she is a ICU nurse, so she was a great translator/support for me when doctors and nurses started talking about Kyle's progress. Once we entered Step Down (2 weeks after his surgery), I felt the progress despite the small crowed room we were placed in. Kyle was happy to have a change of scenery, and was finally feeling tired after 2.5 laps walked (his all time high) and not sleeping more than an hour in 3 days. He looked ready to sleep but the doctors decided to prescribe him Sonata a sleep aid to guarantee a good nights rest. He was looking good so they weren't nearly as worried to give him a sleep aid. After Alli and I grab some dinner at the hospital cafeteria and tucked Kyle in I decided to sleep at home, as there was no place for me to sleep in his new room. Kyle assured me that he was fine as he was excited to get some rest. At 6:00AM I got a call from the ICU informing me had been transferred back to the ICU at 5:00AM because his CO2 levels had shot over 100 causing hypercarbia. Hypercarbia can cause dizziness, drowsiness, and mental confusion. Due to the excess levels of CO2 Kyle's eye's rolled in the back of his head and he went in and out of consciousness. After the nurses and returned him to the ventilator to support his breathing he started to come to. Once he was awake he was unaware of his surroundings and fought to remove the ventilator they had just placed him on. They restrained him so they could perform 2 bronchs to test cultures that could be growing in his new lungs. They wanted to weed out any possible infections. From about 6:00AM- 3:00PM he wasn't himself. I won't go into detail but he was angrier than a hornet. The excess levels of CO2 caused his demeanor to change, and he was constantly on a mission to remove the ventilator and had a few choice words for his nurse. Even though Kyle was out of it, and there was a sense of disappointment being back in the ICU (only 12 hours later) I knew his recovery would bounce back and forth due to the complexity of his surgery. I was determined to not let it get me down as he was still making progress in other areas. We spoke with the kidney transplant team and they informed us he would never have to use the Permcath they had placed in his chest for dialysis, as his kidney was acting heathy and producing a great amount of urine. His creatinine level was 1.5 (now 1.1) after being 3 for the last 10 years. His kidney was looking like that of a normal heathy adult. This was something to be thankful for despite the minor set back. The following day Kyle was taken off the ventilator to start his second round of 48 hours off the vent on the collar. They removed yet another chest tube leaving 3 of 7 chest tubes. Tonight he is closing in on his 48 hours and we are hoping to hear more about being discharged to Step Down possibly tomorrow or Tuesday. The doctors said he would probably be looking to get his trach downsized from an 8 to a 6 early in the week and eventually will be subjected to a swallow test to see if he is able to eat or drink. They are extremely cautious of patients aspirating in their new lungs which leads to bacteria/infection and eventually rejection. To avoid this they perform swallow studies to see what they can tolerate without compromising their new lungs. Kyle can't wait to drink water, or anything at this point, which the doctors said is one of the hardest parts of transplant, feeling parched. Kyle continues to make progress because of his determination, strength and with the love of our family and friends. Thanks to those who have called (the list is long), written us letters, texts and sent care packages. Your love has kept us going! Thanks again to our visitors: Dean, Kela, Tina, my mother, and Alli, we feel so blessed to have had you here with us during this time. Also, old friends aka Sara Boeding for being a great friend and familiar face so very far from home. xoxo! After a night of sleeping at home, thanks to Tina manning our hospital post, I woke to my empty quiet house forgetting what day it was. I could only think of rushing back to the hospital to see Kyle. I hated leaving him but was glad to shower and sleep after 3 days spent in the hospital. Pulling into the empty hospital parking garage I couldn't help but think, what day is it? Everyday was starting to run together, days to night in a blink of an eye and others just dragged on. The waiting room was just as empty and then it hit me, it was Thanksgiving. Every other year Kyle and I spent Thanksgiving with our families, engorged with food but not really taking time reflect on all the things we were thankful for. I believe we are all guilty of taking certain life pleasures for granted. I am the biggest offender. When you have your health, family and wonderful friends around you on the regular you get spoiled into thinking everyone has it this good. I can honestly say, I am luckiest girl in the world. I have an amazing family who has embraced me as I am, and encouraged me to be me from day one. Not to mention my best friend I like to call my husband, who with just one look, can make me feel like I am the center of his universe even in my most unflattering moments. I really wonder what I have done in my life to deserve such wonderful people. This Thanksgiving I couldn't be more happy to be spending it in the hospital in the company of Kyle's mom, Kyle, Kyle's nurses and doctors. Thanksgiving will never be overlooked as it once was. This year's gift will forever be reflected upon and will be appreciated everyday. After sitting in the waiting room, patiently awaiting the arrival of the front desk woman to let me back to Kyle's room I couldn't help but notice a woman with a long island accent talking on the phone. Seeing as it was Thanksgiving and it was a ghostown I figured I would introduce myself as we waited. She introduced herself as Barbara. She told me she hadn't left the hospital in over a month due to her husbands bout with asbestos exposure in the Army. Because of her husbands exposure he had to have one of his lungs removed. He had experienced many ups in downs in the ICU. I couldn't help but feel a sigh of relief that she had understood some of what we had been going through. Not long after we were called to come back to our husbands rooms. Kyle luckily had a decent night while I was gone despite having is trach leak blood after some trach collar trials he was doing in the morning. Dr. Gustavo Parrilla , who performed the tracheotomy originally mended it by stitching one stitch and it seemed to be fixed. After a long day of continued trach collar trials he was exhausted. It was about 9:00p.m. and he was happy to be put on the vent. He had been experiencing allot of anxiety being taken off the ventilator seeing as he was use to shallow breathing with his old lungs, and his brain still was not programed to work perfectly with the new lungs. He was told these anxious feelings would start to go away as his brain became more trained with the new lungs. As Kyle and I sat chatting or as I lip read his trach collar started oozing a tremendous amount of blood. The nurse wasn't overly concerned at first as this can happen occasionally from the transition from on and off the vent. As he continued to ooze towels full of blood I started to get extremely worried, as that amount of blood loss seemed to be excessive. Eventually his blood pressure started to drop and the surgeon came back to inspect him. All of sudden there was a sense of urgency among the nurses and doctor as his blood pressure continued to drop, and the room started to fill with doctors and nurses. I just sat there and prayed as I knew this wasn't normal. Eventually the nurse escorted me out of the room so I could sit in the waiting room while the doctor performed a bronchoscope to check the source of the blood lose. Kyle's first day sitting up in a recliner. After an hour or so in the waiting room the doctor came out to say they had stabilized him and the bleeding had stopped. They had to give him a blood transfusion because of the blood lose. I felt so touched by the doctors concern for Kyle as he had performed the trach without any issues the day previous and said he was so frustrated because there was no real reason for the bleeding and he was upset it happened on his watch. His sincerity is just one reason why Duke has been an amazing life changing place for Kyle and I. We have always been treated with care, and everyone genuinely wants to see Kyle progress. The following day was much better as he got all the tubes/caths removed from his neck, and they placed a pick line in his arm to make things easier for when he was able to start move around. The remainder of the day was dedicated to 6 hours off vent, rest on vent, then another 4 hours off vent. He got a decent night sleep that night as he had worked so hard to acclimate his lungs to working on their own. Today started off pretty uneventful but as the day progressed he had his leg/groin cath removed as well as one of his chest tubes (used for drain fluids from his lungs). The only new issue was that his feet started developing large blisters that took up the entirety of his toes. They were concerned at first that this was a allergic reaction to some of the medications. They later determined it was most likely from the pressure meds they gave him earlier in the week because he was in such fair condition during his surgery. Sadly, the blisters may slow him from walking but as they start to wilt and dry up they should heal enough for him to get on his feet. Once the doctor made the floor rounds he encouraged the nurses to get him in an upright position so he could really open his breathing. Eventually they decided to use the lift to get him into the recliner. It was so nice to see him in a more natural position :) They were hoping to get him cruising around the hospital in his recliner but as the night continued it got a bit late to make any recliner rounds. I am so proud of Kyle as he tackles each new obstacle with such strength and pose. His fearlessness inspires me everyday, and I know we will work through each issue together. 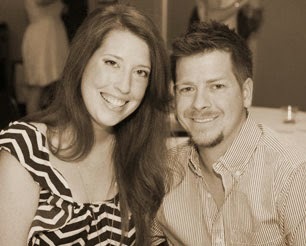 We continue to pray his lungs show progress, and that his kidney starts to wake up from it's dormant/stunned state. Thank you again for your love! We are so very grateful for the support!